We rode the funicular at a sharp angle to the top of Niesen mountain, a pointy peak 2.5km above sea level. On one side, way below, yachts floated on lake Thun like white butterflies . On the other, Swiss dairy farmers, shoppers and truck drivers went about their chores while I took their pictures from the gods. Gliders and light planes flew among the peaks. It was breathtaking. If East Timor's mountains got snow they'd look like this. As good international citizens dedicated to the spread of humanitarianism, the Swiss are preparing guidelines to help post-conflict societies learn from the mistakes of others. So it was that I had found myself in Bern, Switzerland, for a conference, to present a case study on East Timor. Now Elizabeth, the main conference organiser, her husband Michael and their kids were hosting this excursion to the mountains. We tried to tell her she'd already done enough for us but she wouldn't hear of it. Over lunch we reflected on the perhaps unlikely similarities between Swiss and East Timorese society. East Timor is currently considering introducing compulsory military service for its burgeoning youth population. Switzerland already has such a program (for young men). The policy has been vigorously contested since the end of the Cold War with many asking why a neutral country with no enemies needs an army at all — a proposition once mooted by Jose Ramos-Horta for East Timor, but later (sadly) abandoned. The program in Switzerland has survived but alternative civil service (helping the elderly, for example) is now permitted and, consistent with its tradition of neutrality, Swiss soldiers may not fight in other people's wars. Given this and Switzerland's Protestant majority I wondered why Swiss Guards protect the Vatican (albeit with medieval meat-cleavers only) and learned that their role in Rome is a relic from the distant past. Linguistic diversity is also common to both Swiss and East Timorese societies. Our hosts spoke in German, but the Swiss at the next table preferred French. Both were proficient in English. In Bern I'd found everyone spoke German and there were few concessions to French, even on street signs. Graffitists preferred English ('F... the cops'), and locals seemed to be touchy about Genevese who, they say, fancy themselves more frog than Swiss. Like East Timor, Christianity has played a big part in Switzerland's history and is evident at every turn. I visited the Cathedral, a late Gothic structure, its steeple pointing the way to heaven like a giant index finger, but couldn't decide which brand it was. It looked Catholic but was rather bare inside. The lady in the souvenir shop told me it was built in 1421 as a Catholic cathedral but was taken over by the Protestants 100 years later, who stripped it of icons. It has been a reformed church ever since. East Timor's biggest ecclesiastical corporate takeover has been Catholic; here, the Catholics have been on the receiving end. I went to Mass at the Christian Catholic Kirche of Sts Peter and Paul in Bern. Built as a Catholic church after the Reformation, it was taken over by dissidents who deleted reference to Rome in the title because they rejected the Vatican's centralisation of power, and papal infallibility. Otherwise they regard themselves as the real thing. The iconography of this building was Catholic. But the Mass was led by a woman celebrant, who'd been elected by the parish. This progressive approach had not automatically reversed the decline in numbers so common to churches in the West: the vast church, newly refurbished with public money, was half empty, and those present were mostly over 50. By contrast, Der grosse Gatsby, which I saw the previous night, stacked them in. In Geneva I visited the UN to talk human rights, and the International Red Cross to discuss their East Timor archives. The confetti of tiny flowers sprinkled on the grass told me that spring was on the way but otherwise Geneva felt like Melbourne in winter. Wet, grey clouds sagged over the lake and the cold sat sharp on my face. The weather seemed to express the mood of this city of international public servants paid to resolve the world's problems, some like Somalia and Syria so seismic they go off the richter scale of human pain. My Red Cross host conveyed a vivid sense of the scale of it all when he told me they have not digitised their East Timor records yet because they've been working on World War I and the Spanish Civil War and will probably do World War II next. On my last night I dined with a British human rights policy expert and a Norwegian psychologist who has served for eight years on the UN Committee Against Torture. Our main topic over dinner was their draft primer on health and human rights for remote rural communities in the poorest corners of the world. That's Geneva. Clean, ordered, pretty, earnest, and struggling to make the world in its image. Pat Walsh AM is a human rights advocate and author. 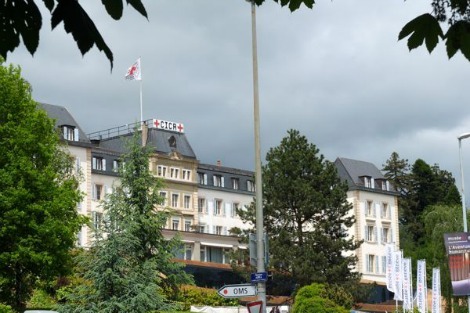 Pictured: International Committee of the Red Cross, Geneva. Actually, Pat, you'd find Swiss German (the spoken dialect) basically incomprehensible to most German speakers except for possibly some Bavarian/Austrian Tyroleans whose own is similar. Speaking Suisse Deutsch isolates non-speakers in a way French and Italian (but not Romansh) don't. The Swiss have a very mixed record at certain times in international affairs (World War II springs immediately to mind where they were, effectively, Hitler's international bankers). You might like to read Daniel Silva's fact-based novel "The English Assassin" which revolves round the acquisition of Old Masters during WW II by the Nazis and their ending up "innocently" in Swiss collections. A friend of mine, a former British diplomat, was of the opinion that the Swiss profited greatly from all the UN and other organisations in their country. "Always a franc in it" he said. Jose Ramos Horta, wearer of Nehru suits (possibly attempting to gain some of his prestige?) now lives far, far away from the poverty and dangers of East Timor in France: a country with most respectable Armed Forces. They even possess nuclear weapons. I suggest he contact Mr. Hollande about giving these up. As I read this article, I was struck by the great contrast between a society steeped in wealth and power, Switzerland, and a nation struggling to find a voice, East Timor. Switzerland perhaps can afford neutrality - nestled safely within a wealthy (for the most part!) Europe, of no real strategic importance in terms of locality and its citizens well fed. Somalia, Syria and countries struggling and in conflict would have every reason to view the talkfest in Switzerland as something akin to fantasy. I wrote in my article that Protestants were the majority in Switzerland. Professor Google tells me this is not so: Roman Catholics are the majority. Apologies to readers for this slip. Edward F: I am sure, like many of us, Jose Ramos-Horta would like to be living in France, but actually he is the UN Secretary-General's Special Representative to troubled Guinea-Bissau. You can have neutrality only, if you can defend yourself. During both World Wars it was clear, than a declared neutrality meant nothing to aggressors. Denmark for example did not last very long despite being neutral. If you have a credible defence and neutrality, you can make sure that your people are only going to die for the defence of your country and not for some glory hunt in foreign lands. Neutrality would be ideal for Australia, as our biggest friends (Japan, China, USA) may one day be on each other again. Neutrality does not exclude taking part in UN peace missions, but would prevent our soldiers having to die in the defence of other countries foreign policies. Pat, I read somewhere that J R-H was now based in France. Forgive me if I'm a little cynical about some of the mestizos like him, who, because of their advantageous position under colonialism, including a good education, rose to the top in the Independence Movement. I think they have done rather well out of it. I am sure that the likes of Gusmao will be sending their children to be educated in Australia at places such as Riverview or Loreto Normanhurst. The disparity in living standards between the elite and the average person is quite high I believe. Please correct me if I'm wrong. BTW I found some of your articles, such as the one concerning your daughter's stay at an Islamic boarding school on Java, inspiring. Having been born and spent my early years in India as a member of a family who had been "out there" serving the Raj for five generations I was vastly impressed by the calibre of Nehru: a genuine giant of a man. I find J R-H appears to be attempting to copy him in dress. There is, to my mind, no comparison. There I've explained my dislike! Pete lives with his grandfather at an abandoned drive-in cinema outside a remote community. When a mining company threatens to reclaim the land and demolish their home, he sets out across the harsh outback to confront this corporate Goliath. If he is to survive he must draw upon the traditional wisdom his grandfather has passed on to him.